Children at Bumble Bee learn that not all people have the same opportunities in life, and therefore it is important to help those in need. The guidance and partnership approach, which we use with children, helps to develop their sense of friendship, helping and charity. In the year 2015 we decided to contribute GOOD ANGEL Foundation. This foundation helps families with children where the father, mother or some of the children sufferes from cancer or other serious diseases. In December 2015 we organised charity market, where parents of Bumble Bee children had opportunity to purchase products made by their children. We managed to collect total of 7.150,- CZK BIG thank you to all of the participants! Kamila lives with her boyfriend and children Klara (* 1999) and Jindřich (* 2009) in Nová Role near Karlovy Vary. Klára is a student at secondary school, Jindra is a preschooler and attends kindergarten. However, in February the doctors gave his parents some serious news - Jindra had been diagnosed with acute lymphoblastic leukemia. This type of leukemia is the most common ailment of children. Luckily the chances of complete cure are quite high thanks to new approaches. Treatment is usually long-term and requires a long period spent in hospital. After completing the treatment their immunity is very fragile, they must follow a specific regime, which includes a costly strict diet. It is necessary to limit the potential risk of infection, so doctors do not recommend mixing with other children. Jindra gets treatment at the University Hospital in Plzeň, where he is undergoing chemotherapy. Treatment of leukemia is long and in most cases lasts for at least 2 years. Jindra´s parents are very thankful and send many thanks for the support and willingness to help. The treatment of this disease costs a lots of money and to be able to take care of a sick Jindřich, his mother had to limit her time at work which led to less funds in the family. We are very pleased that we can teach our children to help each other and to be sensitive and considerate to people in need. Children from Bumble Bee are suporting Arch Chantal Foundations since 2003 and have contributed with almost 385 000 CZK!!! Parents created 50 dolls together with their children and their teachers from Bumble Bee. Thank you very much for your support! The dolls will be donated to a specialized nursing unit of some Prague hospital. Teachers talked with the children about the Kiwanis doll and its purpose during the circle time. Morning project was focused on the Kiwanis doll. 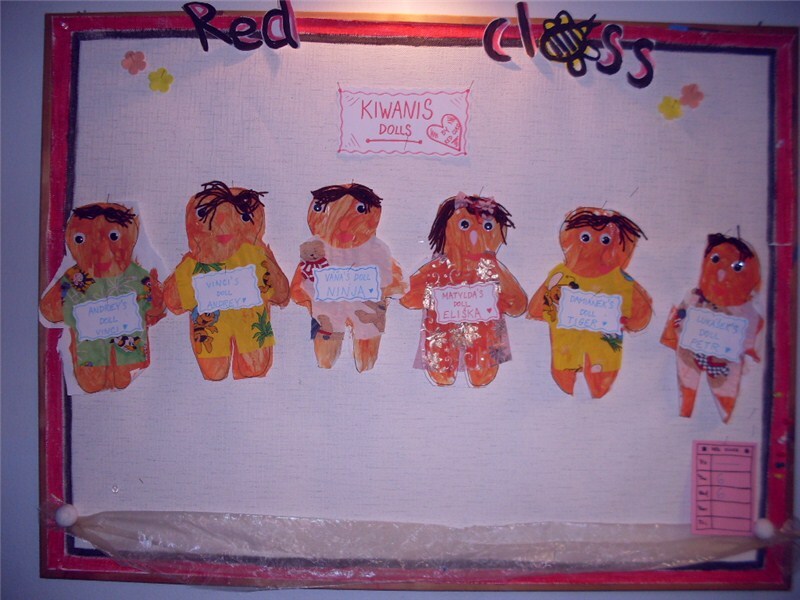 The children decorated the paper template of Kiwanis doll using their imagination. All rights reserved. Bumble Bee, School of Creative Children.